Don't let the quietness fool you. 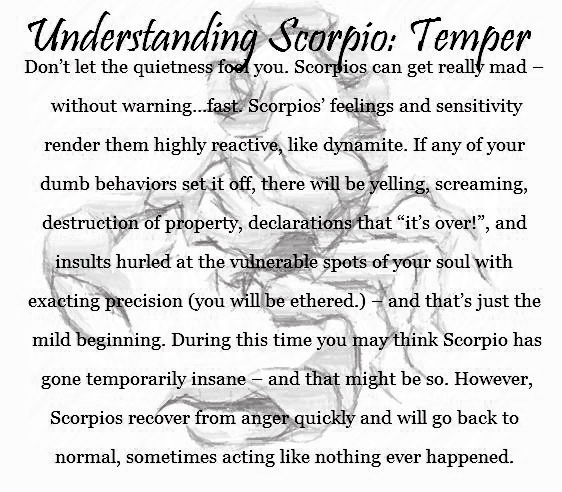 Scorpios can get really mad - without warning... fast. Scorpio's feelings and sensitivity render them highly reactive, like dynamite. If any of your dumb behaviors set it off, there will be yelling, screaming, destruction of property, declarations that "it's over! ", and insults hurled at the vulnerable spots of your soul with exacting precision (you will be ethered.) - and that's just the mild beginning. During this time, you may think Scorpio has gone temporarily insane - and that might be so. However, Scorpios recover from anger quickly and will go back to normal, sometimes acting like nothing ever happened.